Chinese New Year celebrations in Chinatown are traditionally held by Chinese societies at various times, but two former University of Hawaii graduate students are helping to change that. In 2006, UH business school graduate students Lee Tokuhara and Evan Leong organized a cohesive New Year's celebration as part of their capstone project, coordinating the different celebrations into a month-long event that the city later embraced. 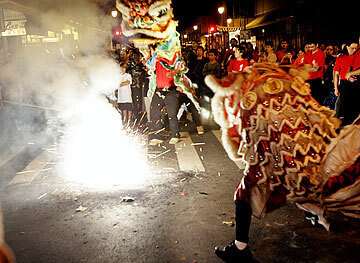 Information on this year's Month in Chinatown celebrations can be found online at www.chinatownhi.com or by calling 948-2007. Yesterday, Mayor Mufi Hannemann announced the city's Month in Chinatown -- a month-long celebration of the Chinese New Year, beginning the first weekend in February. Tokuhara and Leong are back again this year volunteering as co-chairmen with the city and several organizations to produce the event. Resources are being pulled together to produce a cultural celebration that will show the community that the city is following through on its promise to revitalize Chinatown, Hannemann said, and to "really bring it out in grand style." The city sponsored the festival as part of its Chinatown Summit with the goal of revitalizing Chinatown as the focal point for culture and arts in Honolulu. "Some of these events were suggested in the highly successful Chinatown Summit we held in June," Hannemann said in a news release. During the celebration, revelers can enjoy lion dances, fireworks, exhibits, Chinese singing and dancing, martial arts and feng shui demonstrations, fortunetelling, cultural food and a movie at Aala Park. All events are free. "Now we have one master list, calendar of events, and it's really clear," Tokuhara said. Edward Pei, the general chairman of the Narcissus Festival, said the celebration is about bringing the rich cultural heritage and the people back to Chinatown. "By joining forces we're able to leverage resources and really put on a better show," he said. The Year of the Boar starts Feb. 18. Events will be held every weekend in February. The Chinatown Summit was the first of a series of community summits the city is considering to revitalize communities, said Ann Chung, director of the city's Office of Economic Development. The next community summit will be in Kalihi on Feb. 12 at a site to be decided. "Kalihi is an area that hasn't been focused on for a long time," Chung said.